$29. YOURS FREE! Coupon pre-applied — just click to register at NO COST. 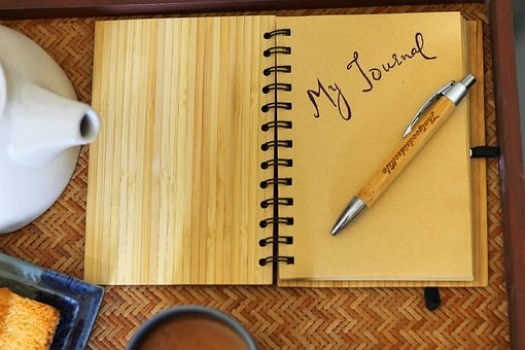 Does your journal need a jump start? Take heart! In this free course you'll be offered seven lessons containing a total of 68 writing prompts to take you inside, outside, through silence, into authentic expression, and much more! No experience needed -- just a pen(cil) and notebook, or keyboard and screen. And if you’re an experienced journal writer, you’ll likely enjoy the back-to-the-basics review with some new material on silence in the journal and a closer look at the reflection write. Includes a PDF of written text. Graphic created by Journal to the Self student, 2017. Used with permission. Journal writing is all over the news as a holistic, non-medicated route to personal growth, creative expression and life management. And it's fun and easy! It doesn't matter if you're a brand-new journal or have been doing it for years--there's something for everyone here. We'll start with the basics, then jump right into practicing a series of 18 different journal techniques--ways to write that bring insight, variety and results to your writing. Discussions bring rich engagement with fellow writers and your expert guide, teaching assistant Carolyn Koehnline LMHC, a certified Journal to the Self instructor and certified journal therapist. Write on! PS: Great news for digital journalers! A 2015 study found that it doesn’t matter if you write by hand or on a keyboard—the benefits are the same. 1.5 CE hours for psychotherapists! $39. TAKE $20 OFF AND REGISTER TODAY FOR $19! Coupon pre-applied — just click to register at $19. In this quick, easy, fast-paced workshop you'll transform your relationship to a particular stressor through a sequence of writing processes that take between 2 and 15 minutes. You'll learn a method that has proven successful with hundreds of people in dozens of workshop rooms and can be used over and over for any situational stress. Chances are, at the end, you'll be surprised and delighted with your transformation.